We are a full-service charter, specializing in fishing trips, wildlife viewing, and sunset bay cruises from the Santa Cruz Yacht Harbor. Our 30′ Island Hopper is the perfect vessel to enjoy the Santa Cruz coast and beyond. The entire Central Coast of California is our playground. Your captain JT has fished waters of Santa Cruz and Monterey Bay for over 15 years. 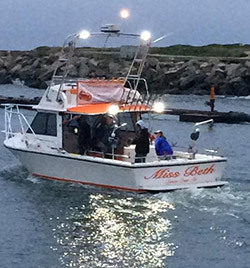 Miss Beth is a 30′ Island Hopper fully equiped for adventures on the bay. 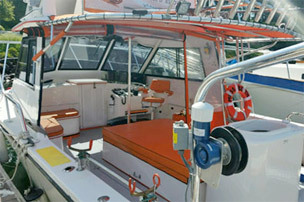 With a large fuel capacity, trips can range from San Francisco to Big Sur, or out west to the tuna grounds and beyond. Miss Beth features 100 square feet of unobstructed deck space that gives six anglers plenty of room with open state of the art electronics floor plan. We have something for everyone – Fishing trips, scenic bay cruises, whale and dolphin watching and crab and rock cod combos. 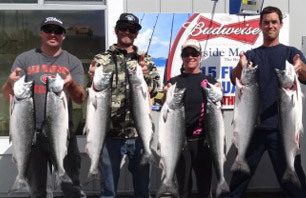 You will have a blast fishing beautiful Monterey Bay and scenic Santa Cruz. “Had such a blast! Everyone walked away with six crab each as promised.